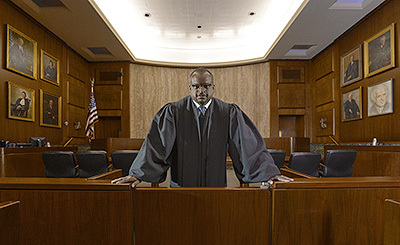 When federal judge Robert L. Wilkins reminisces about his career as an influential jurist and civil rights activist, he credits his years as a chemical engineering major at Rose-Hulman with providing a solid technical foundation for his legal pursuits, as well as a community of peers who were driven to succeed. "Success breeds success," Wilkins says. "So when you are around those smart, highly motivated people who are goal-oriented, you can't help but be affected by that. Certainly that was the case at Rose-Hulman. I was assisted by the same dynamic when I went on to law school at Harvard. The peer group, the high standards, and the striving for excellence that I observed at Rose-Hulman helped propel me." A 1986 Rose-Hulman graduate, Wilkins was appointed to the U.S. Court of Appeals for the Washington, D.C. Circuit in January, after being nominated by President Barack Obama. He handles appeals from federal administrative rule-making bodies, including disputes regarding environmental, energy, and communications law. Partner at Venable, LLP, a Washington, D.C., law firm, 2002-2010; specialized in white collar defense, intellectual property, and complex civil litigation. In 2000, founded a non-profit organization that successfully lobbied to create a National African-American Museum and Cultural Complex. Helped establish the Smithsonian Institution's National Museum of African American History and Culture, serving on a special commission established by President George W. Bush. The museum is scheduled to open in 2015. Filed Wilkins, et al v. State of Maryland in 1992 after being subjected to a vehicle search when pulled over for speeding, won a landmark settlement in this civil rights lawsuit against the Maryland State Police, and brought national attention to the practice of racial profiling. The settlement requires systematic compilation of data for all highway drug and weapons searches, including the race of the motorist. Prior to assuming his appellate judgeship, Wilkins spent three years as a district judge, eight years as a partner with a prestigious D.C. law firm, and a decade as a public defender. He also helped found the National Museum of African American History and Culture and won a settlement in a landmark lawsuit against the Maryland State Police for racial profiling. For Wilkins, the road to an esteemed federal judgeship at the nation's second most important court included many unexpected twists. Raised by a single mother in Muncie, Indiana, Wilkins first visited Rose-Hulman as a participant in the Operation Catapult summer program after his junior year at the now-defunct Muncie Northside High School. "I fell in love with the campus," Wilkins recalls. "The engineering coursework was intriguing and a great experience. Rose-Hulman was definitely my first choice…I liked math and science, especially chemistry, so chemical engineering seemed like a good choice." At age 18, Wilkins had no interest in pursuing a graduate degree. But after three summers spent working in the engineering department at Ball Corporation, he became interested in government and political science, and decided to attend law school. He graduated from Harvard Law School in 1989 and embarked on a legal career dedicated to civil rights issues. "At Rose-Hulman, I was involved in student government and the interfraternity council. I was being exposed to governance issues," Wilkins explained. "I really wanted to be part of bigger issues in the world, and not just working on an issue that might affect one company, one product, or one plant." Wilkins, who received an honorary doctorate of engineering during commencement this spring, encourages current and prospective Rose-Hulman students to keep an open mind for their careers. "I'm the perfect example of someone who thought he was very certain about what he would be doing after four years at Rose-Hulman," he says. "There ended up being a pretty drastic change in plans that worked out well for me." Wilkins adds that the technical skills he developed at Rose-Hulman have been useful throughout his legal career. "I rely on the problem-solving skills that I developed as an engineer every day," Wilkins states. "I also rely upon the analytical framework I learned at Rose-Hulman. It definitely affects how I look at the law and how I deal with legal issues. I try to sort through the law to determine what the rule is…To the extent that I can help formulate a clear rule, I think my training as an engineer pushes me to do so." On the bench, Wilkins runs into technical issues on a daily basis. That's when his engineering background is most useful. "We've had cases involving international satellites, regulation of telephones, mining issues, and intellectual property involving helicopter design," Wilkins says. "Every week, there is some aspect of technology or science that I have to delve into for a case." Wilkins also has found that being an engineer is an advantage in the political realm. For example, Wilkins took an objective, analytical approach to successfully lobbying for the Smithsonian Institution to create an African American history museum. "Lots of people had worked on trying to make the museum happen for decades. When I got interested in the issue, the first thing I did, using my engineering training, was to study those efforts and determine what went wrong so we could change our approach and get it right this time," Wilkins says. Similarly, Wilkins took a problem-solving approach when he was pulled over for speeding by the Maryland State Police and subjected to a drug-sniffing dog search. As lead plaintiff and co-counsel in a lawsuit stemming from that incident, Wilkins exposed racial profiling practices and won a settlement that requires the police to track traffic stops and the race of the driver involved. "The lawsuit was an opportunity to take a negative experience and turn it into something positive," he states. Wilkins is excited about continuing to make a difference for society as an appellate judge, and he is confident that he will continue to rely on his Rose-Hulman education. "I believe my education from Rose-Hulman has helped me to get here and will help me to, hopefully, be a good judge by taking a problem-solving approach in the cases that come before me, understanding technical issues, and articulating clear, workable, and effective rules and guidelines," he sums up.